If there’s one thing I’ve learned in life, it’s that everything moves in cycles. The earth travels in a cycle around the sun, helping to create the seasons, which are also cyclical. Life itself is a cycle. Investing and businesses, too, move in cycles, from boom to bust, bull to bear, peak to trough and back again. Among the most profitable sectors for cyclical investing is technology. And right now, we are on the verge of a major new tech cycle that could make you millions. That cycle starts with 5G wireless — not the fake 5G that AT&T is peddling, either. I mean real 5G wireless with download speeds to your smartphone of roughly 1.4 GBs per second. That’s faster than many landline connections available right now. This is a technology mega trend that my colleague Paul Mampilly is very excited about. And it’s only a year or two away from hitting the mainstream: Verizon is set to begin rolling out 5G in select markets this year. With a new standard for wireless communication comes new hardware. Smartphone and mobile device makers will finally have something more to boast about than just minor increases in screen resolution. Internet of Things companies will have more wireless bandwidth to provide more remote data accessibility than ever before. But to fully take advantage of 5G’s potential, those smart devices need better hardware. And they need it now. That means faster and more efficient semiconductors and higher-capacity memory chips. That also means more advanced and precise machinery to quickly mass-produce those chips. Today, we’re going to look at an investing opportunity that leverages the next technology mega trend as manufacturers begin to gear up for the 5G revolution. Flash memory makers have been in a funk lately. Big-name companies like Micron Technology have seen their momentum scuttled and their stock prices devastated due to analyst forecasts for slowing demand. Low smart-device sales are to blame, as they are the biggest source of flash memory demand in the market. The advent of 5G is about to change that. Currently, smart devices have little to offer in terms of upgrades. Blazing 5G speeds offer a wealth of new possibilities. But the next generation of smartphones and the like will need the memory capacity to fully take advantage of this new mega trend. And current NAND memory has hit its limit in terms of capacity for the limited space in mobile devices. This next-generation technology builds on existing 2D NAND memory, but increases storage capacity and reduces space. You’re not here for a technology lesson on the workings of memory, but 3D NAND essentially stacks 2D NAND in layers. This stacking increases storage, improves performance, reduces space and decreases power usage. These criteria are crucial for small, portable smart devices. What’s more, the increased storage space is a must for next-generation mobile devices to take advantage of 5G speeds. To build these next-generation chips, semiconductor fabrication companies like Lam Research and Applied Materials need more advanced tools. And with 5G on the horizon, they are gearing up now. Many investors are focused on the 5G prospects for the Verizons and Microns in the market. Others have zeroed in on Lam Research and Applied Materials, as they will be making the next-generation 3D NAND chips. These are good opportunities. 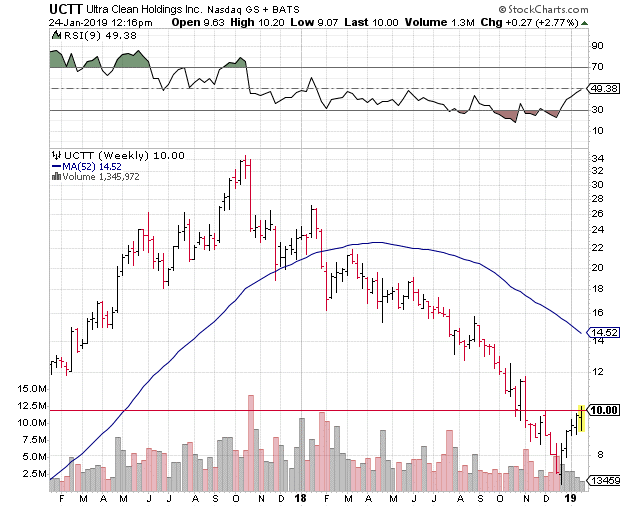 But the ground floor of this next mega trend begins now with companies like Ultra Clean Holdings Inc. (Nasdaq: UCTT). Ultra Clean makes the tools that both Lam and Applied use to mass-produce memory chips. They’re Ultra Clean’s two biggest customers. Other customers include ASML Holding, Taiwan Semiconductor and KLA-Tencor. And these companies, in turn, feed chips to the major technology companies like Apple, Intel and Nvidia. The point is, it all starts with Ultra Clean. As you can see from the chart, UCTT stock is seriously undervalued right now. The stock suffered in 2018 as projections for NAND memory sales fell, meaning less capital equipment orders for Ultra Clean. But the stock hit a bottom last month, resulting in a bullish “V” pattern rebound for UCTT. The stock also retook the $10 level, which is a bullish psychological development for the shares. In short, investors are starting to realize that Ultra Clean stands to reap considerable benefits from the 5G mega trend as chipmakers gear up to meet new demand for high-tech 3D NAND chips. This may be the last time in the current cycle that UCTT stock trades in the single digits.